A whisky that has become the icon of Japanese whisky’s recent rise to global prominence, and one of the most consistent bottlings out of the land of the rising sun. A classic blended Japanese whisky, this is bottled at a robust cask strength of 51.4% ABV, “from the barrel”, as it were. This bottling includes whisky from Nikka’s Yoichi and Miyagikyo distilleries in the mix. After blending the spirit together, Nikka allow the whiskies to marry for between 3 to 6 months, which they consider for vital for the integration of flavour. 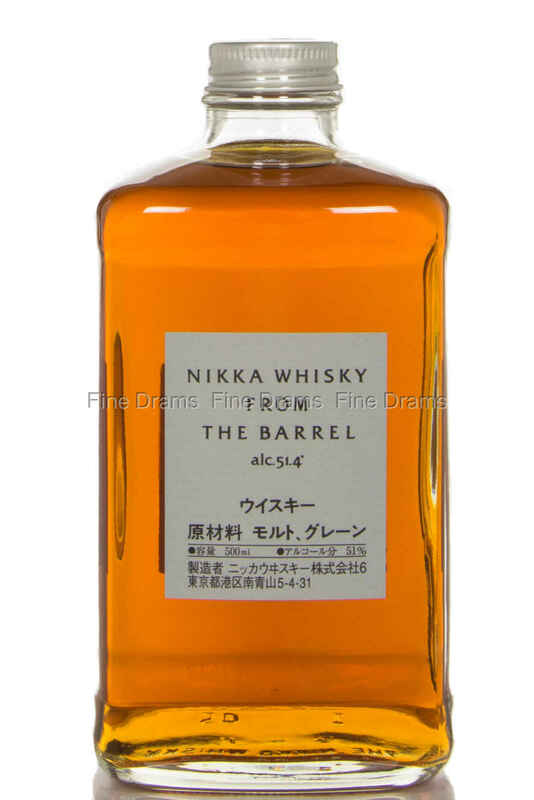 Nikka From The Barrel serves up huge flavours of winter spice, citrus rind, raspberries, cherry, oily nuts, toasted malt, milk chocolate and dark oak. Exceptionally balance, yet incredibly powerful, it is hard to overstate how delicious this dram is. Despite the general price rise in the Japanese whisky market, this bottling retains its status as excellent value for money. From the meticulous production, to the harmonious flavours, to the simple packaging, Nikka From The Barrel showcases the very best of what Japanese whisky has to offer. Nose: A flurry of bourbon notes: vanilla, sweet corn, cherry caramel. Then some herbs- dried thyme, coriander. Lemongrass and citrus rind- bergamot. Palate: Close to the nose but with a sudden rush of biscuit with raspberries and walnuts. Vanilla, caramel, almonds and strawberries round the palate out. Very flavoursome indeed. Finish: Medium short, spicy and a little oak. Overall: A lovely Japanese dram of exceptional poise and balance. Perfect nuttiness sits alongside fruits and cereals delightfully. One to enjoy after long days.